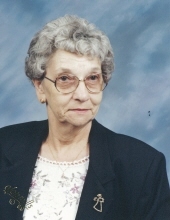 Lucille R. Bain, 91, passed away Tuesday, January 8th at the Iowa City Health Care Center. Funeral Services will be held at 10 AM Saturday, January 19th at Lensing Funeral & Cremation Service, Iowa City, with Rev. Brent Hartwig officiating. Burial will be at Elm Grove Cemetery in Washington. Lucille was born June 17, 1927 in Wayland, Iowa to Samuel and Flossie (Sammons) Rich. She grew up and attended school in Wayland. Lucille married Max Bain in 1946 in Washington, Iowa. Lucille always felt she lost a part of her when Max passed away in 1994. Lucille worked for Ross Manufacturing for eight years while living in Washington. In 1999, she moved to Iowa City and worked in housekeeping at UIHC. Lucille was co-owner of Hamburger Inn in Vinton, Iowa. Lucille was a member of Our Redeemer Lutheran Church in Iowa City, where she volunteered. Lucille’s children and grandchildren were very special to her and she loved them dearly. Lucille is survived by her children, Marion Bain of Surprise, AZ, and Maxine Simmons of Denver, CO; sister, Mildred (Dwight) Manning of Wayland; brother, Wayne Rich of Washington; sister-in-law, Janice Rich of Wayland, IA; grandchildren, Michael Bain, Sheryl (Dan) Shewman, Chanda (Matt) Romain, Carrie (Victor) Salazar, and great-grandchildren, McKenzie, Ethan, Kylie, Calliejay, Averie, Emily, Candace, Tita, and Victor; two great- great grandchildren, Chris and Osiris. She was preceded in death by her parents; husband, Max; son, Marvin; granddaughter, Sherry; one sister, Edith, and three brothers, Everett, Darrell and Kenneth. To send flowers or a remembrance gift to the family of Lucille R. Bain, please visit our Tribute Store. "Email Address" would like to share the life celebration of Lucille R. Bain. Click on the "link" to go to share a favorite memory or leave a condolence message for the family.